Our home sits on a south-facing alluvial fan at the base of the San Gabriel Mountains in Altadena, California. The property is long and narrow, with a charming cottage in the middle and gardens on each end. A beautiful coast live oak (Quercus agrifolia), over one hundred years old, anchors the front garden; little else of the existing garden was worth preserving when we moved in. We are both artists, specializing in site specific installations, both together and individually, that usually explore issues related to California’s native plants; Karen is also an educator, and Andreas a landscape designer. 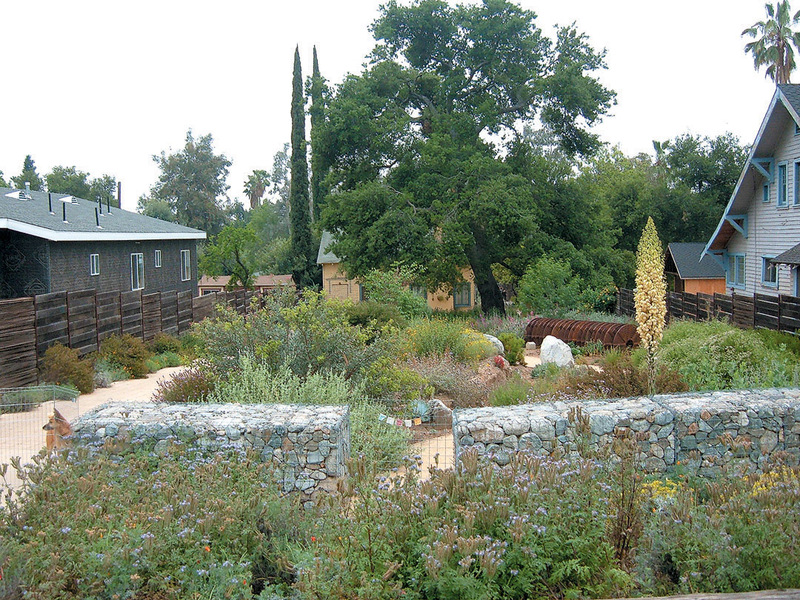 Together, we designed and installed a semi-formal landscape in our front garden, with a contemporary “folly” at its center. Edibles and nursery stock fill the smaller garden behind the house along with water infiltration and compost areas. We maintain the entire garden ourselves. Upon taking ownership of the property in 1999, we removed more than a dozen eucalyptus trees and, sadly, one of a pair of mature olives that stood in the way of a sorely needed studio for our work. We also removed large mounds of trash and debris and cut up dead trees for firewood—enough to last us ten years. 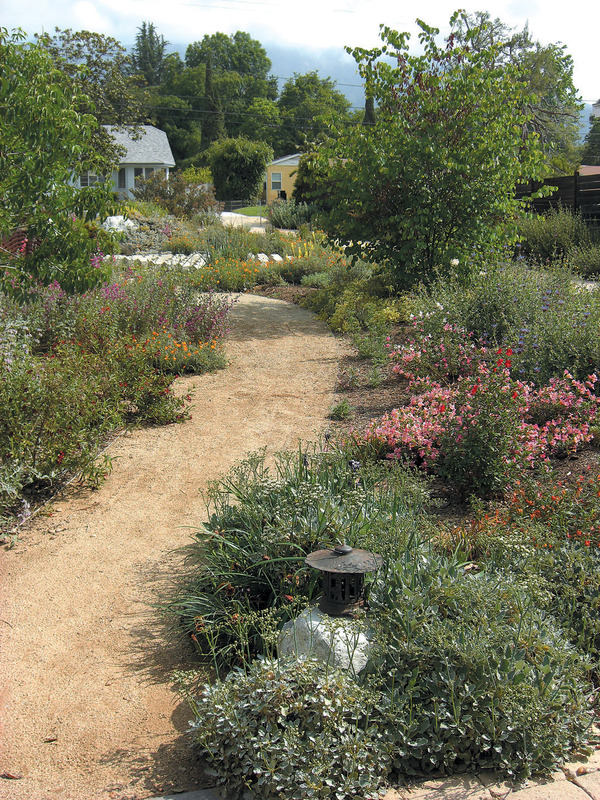 The garden’s design began as a familiar process of imagining what could be done with a long-neglected space. We came to this project as veterans of visualizing and manipulating space for exhibitions and art installations. 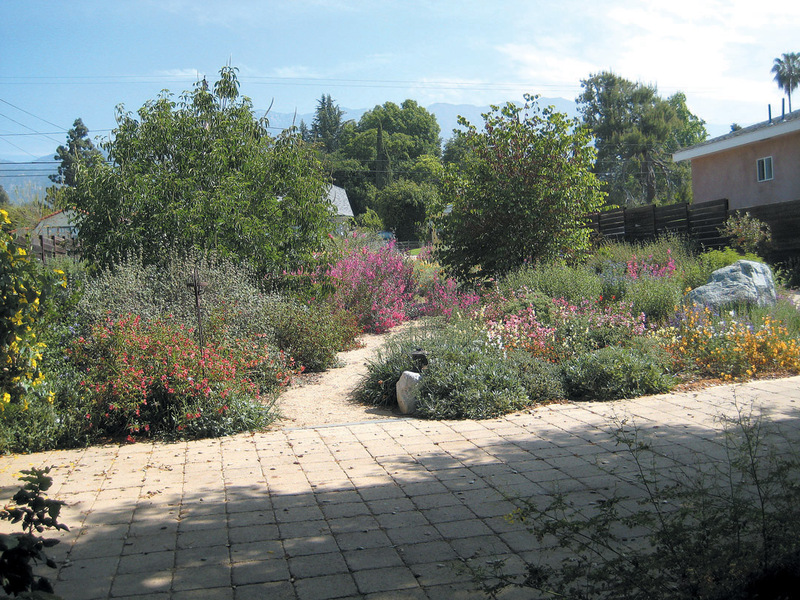 We were already familiar with our native flora, having established our first garden of natives in 1991. We removed all of the exotic plants and solarized the site, from August through October 2003, by putting down a layer of clear plastic sheeting to kill the weeds using the sun’s energy. Once the plastic was removed, we had a weed-free area in which to work. We used various visual aids to layout the ideas that we had sketched earlier, arranging and rearranging sheets of corrugated metal, rusted polishing wheels, rope, and mounds of dirt until the visualization process was complete and we were happy with the composition. 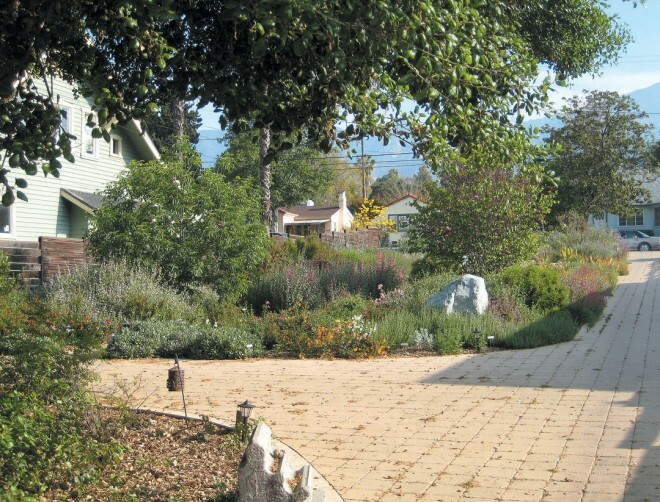 In early 2004, we began construction of the hardscape elements, including new underground utilities. To keep our costs low and send as little to the local landfill as possible, we tried to incorporate as much of the existing materials as we could find uses for in our design. We recycled our existing fencing panels to cover about 300 linear feet along the property line, and finished the remaining 500 feet with additions from various neighbors and other salvage sources. 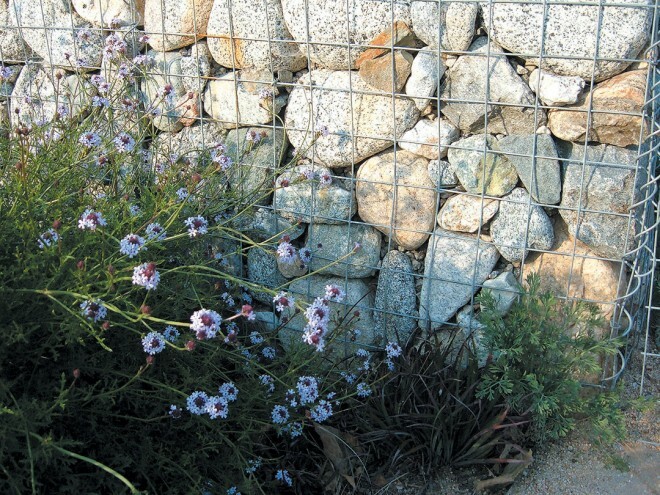 We assembled a low gabion wall across the front of the property to provide a strong frame separating the garden from the street. We laid out a sinuous path of decomposed granite that bisects the garden longitudinally, with boulders placed at strategic points along its route. We intended this to be an ambulatory garden and framed specific compositions to be viewed from the path. A rammed-earth bench marks the end of the path at a resting place beneath the oak. 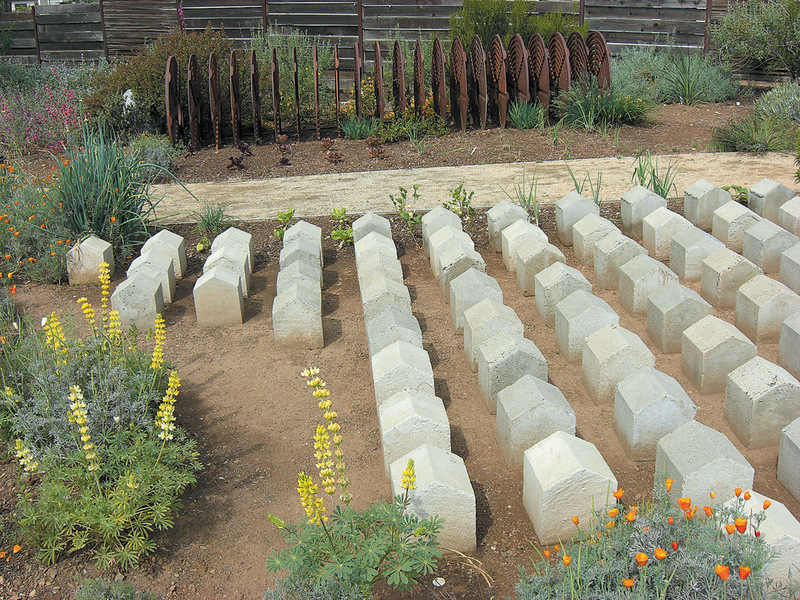 The soil excavated for the driveway became a mound with a steep cliff on one side, providing habitat for Dudleya species and other plants from Baja California. Midway along the path, we installed an art piece, “A History of the West,” constructed of two basic elements: cast iron polishing wheels collected from a local quarry and concrete “Monopoly” houses that we had used in a previous art installation. The polishing wheels were set on edge to mimic a tractor-pulled cultivator left to rust—a tongue-in-cheek homage to farm implements that often appear in frontyard gardens. The grid of concrete blocks, aligned with the “tiller,” suggests both houses and tombstones. Completely visible only from the path, this art piece is a distilled narrative of land use throughout the American West, but, particularly, here in California: agriculture, represented by the wheels and edibles planted around them, cuts a hard-edged swathe through the wild lands, and is so often followed by a housing development that ignores the natural beauty of the land. We left plenty of open space for wildflowers, particularly between shrubs, spaced so that their mature forms would be clearly visible. Although we began with areas set aside for pure sweeps of California poppy (Eschscholzia californica), Gilia, Phacelia, and Clarkia, we have allowed them to migrate and mingle across the property. Whenever possible next to walkways, we planted sages (Salvia), Monardella, Verbena, wild currants (Ribes), and other natives that would release their characteristic aromas into the garden. Now that the shrubs have reached a degree of maturity, the garden has become an extraordinary bird habitat. The number and variety of birds has greatly increased over the years; during morning and evening feeding times, we often see fifty or more birds at a time, perching, drinking, eating, bathing, and scratching beneath the shrubs.